Complete your bar or kitchen with this set of two dining chairs. With their industrial-inspired style and neutral color options, these steel chairs are conveniently stackable when not in use and equipped with non-skid foot glides to protect your floor. Warning tag states: Avoid direct sunlight and high humidity. For indoor use only. Metal to corrode. These chairs look beautiful, as you know if you are here reading this review! 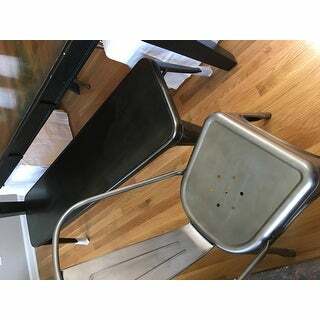 They are a copy of a very popular french cafe chair that is priced much higher and are really a very good knock-off. Let it be known though that they are only 13 inches wide in the seat. Check the dimensions of a baby high chair seat or a youth junior chair and you will discover that many or most are wider. So, even though these chairs are a LOVE AFFAIR, they are NARROWER by far than any other chair I have ever experienced. We are pretty small- average here and they are certainly a squeeze. Do-able, but a squeeze if you want to sit back in the chair at all, vs the tip where it is at it's widest (under 14 inches). Do not buy these chairs if you want a comfortable seat for an average adult. Don't even consider for a larger adult- and don't kid yourself. If you have slender kids, (my skinny 14 yr old son is built like a string bean and wears "slims") can sit in them comfortably but he touches the sides. FYI there is a very expensive and hip company out there that is selling this chair in a wider version called Remy that is considerably wider and at the second lowest price on the internet on sale now- company name begins with R and the second word begins with H. The original french chair also comes in a wider version but I think only with arms. So, do your homework. I love these chairs (look) and ordered 2 in the shiny white. I was hoping to try them out before ordering 6 more and I'm glad (and a little sad) that I did. We are keeping these 2 for our kids. I considered getting moire for other kids, but honestly I don't want my guests to feel embarrassed if they can not fit. So, these stay and we are supplementing with an eclectic mix of other white chairs and may just order the wider ones I mentioned that are a little larger. Too bad I like this shiny white finish and the look the best! I've been watching these on Overstock for months--maybe years. And I've looked at similar styles elsewhere. I finally took the plunge and am so glad I did. I chose the "vintage" color. It's a great neutral, not too brown, not too grey, not too shiny. The finish is smooth. People comment that the chairs are comfortable. I like their sizing. The backs are lower profile--don't stick up high over the edge of the table. I was concerned that because of the curve in the back of the chair that you wouldn't be able to scoot the chair in flush against the table and the chairs would take up too much floor space. Not really an issue. The chairs are much less bulky than my previous wooden ones, and with the curve in the back, the chairs only stick out a few inches from the table. I use them with a white kitchen table and I love the sort of industrial look. Love that you can find these here... All the stores locally sell for 2 and 3x! I ordered 4 silver and 2 black chairs. They arrived quickly, were well packed, and I love the look. Be aware that these are "petite" chairs, with a 15 inch seat. They are sturdy, lightweight, and stack nicely. I will be getting chair pads for them for my guests, but they are fine without. I love these chairs. I have bar stools from the same manufacturer and I love them. They are extremely sturdy and blend beautifully in my kitchen eating area. So I bought a set of chairs for my daughter's dining area to go with her wood and glass topped dining table. She emailed me a picture of the set when she got it and it was simply gorgeous and yet very cozy, just right for a modern woman in the big city. I thought we were the first to combine sleek steel and traditional wood but then my daughter emailed me a picture of the dress designer Vera Wang posing in front of her own dining set--and it was the exact same look--same steel chairs accenting a wood dining table. My daughter said the only addition she made was to purchase cushions because after all these are steel and she sits at the table late into the night working on her studies. I really like these chairs! For the comfort and style it's perfect. I was a bit nervous that they wouldn't be big enough for a 6.5" farm table, but they look perfect! I previously had chairs that were 38" high and these tabouret chairs are approx. 33" high. These chairs look better than my previous chairs and are space savers, as well. I ordered 6 and will be ordering 2 more. They will never have stains and they will only look better with age. These will be my "forever" chairs! We purchased these chairs to bridge the gap between our modern wood breakfast table and a rustic (antique) wood hutch. These chairs absolutely fit the bill. They are versatile in that they can be modern or retro. With two large pieces of furniture in the breakfast room, we wanted chairs that wouldn't feel bulky, and these are perfect in that regard. The height of the back is shorter than we expected, reaching only a couple inches above the top of the table. They push under the table nicely and don't stick out at all. They stack which is a major bonus, and are quite comfortable. We have had no issues with them. They're sturdy and I expect they will stand up to the abuses my kids dish out on chairs. There was really no assembly required. We bought 4, but we'll be buying more to be used as flex chairs that can make their way around the house when needed, but be stacked in a corner or closet when not needed. They're light weight so they're easily transported. Even my 7 year old can pick them up and carry them. This was the best price I could find on this style of chair in stores or online. These are tiny, but we love them. These little chairs are lightweight and fit anywhere for extra seating. We put them at kids' desks, drag them to the farm table on the patio for kids, even use one as a nightstand - in a kid's room. Perfect for... kids! The height is standard, but the seat is tiny. It's only 14" front to back and about the same width in the front. They're probably fine for a lot of adults, but I wouldn't want to offer these as the only option for guests. We keep the Vintage Tabouret Stacking Chairs at the big farm table. They only have a little over an inch more space in seat width and depth, but they're square versus the taper of these. 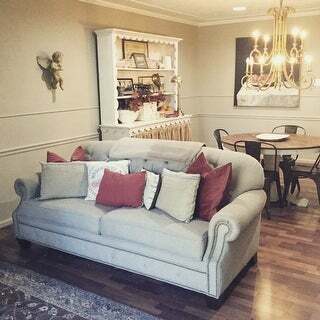 My friend has these same style chairs from an expensive catalog store. She paid 3x as much as I did and you really cannot tell the difference. I would give 5 stars but the chairs are a tad short, but that is the style. So pleased with these cute modern-industrial Tabouret Chairs I just received from Overstock. They are exactly as pictured and described online: nicely finished metal, lightweight, compact, stackable. They are versatile modern-industrial chairs that I am using in combination with 2 Tabouret Tables (using both as side-tables and as dining stools) with my reclaimed wood and metal dining table. I also ordered the Tabouret Tables and they are equally nice. A great price too, for the quality and value that I received. Happy with my first Overstock.com order - I'll be back. I built my own table using pipe and plywood like you see on Pinterest. The table is rugged and I needed some chairs to go with that industrial style and these were exactly what I was looking for. Similar chairs on Joss and Main were $$$ for a pair. I found them on another site and they were $$$EACH. These were $$$ for the pair. I figured they must be different but as I continued to search online I found that these were slightly larger than some on other sites and when I got them in the mail they were so well made that I knew I had really come across a great deal. I bought 6 of them and I have never been happier with an online purchase. I love that there were finally armless tabouret chairs that could push in all the way to the table! They look great, are comfortable, and will clean easily with 3 small kids. A couple of my 6 had paint scratched off in small spots from shipping, but Overstock's great customer service took care of it in one, quick call. The chairs arrived packed very well, no damage. The chairs are solidly built, but light weight at the same time. The chairs are also sturdy, and do not wobble. My family was worried about comfort, but they are quite comfortable. I replaced wood spindle back chairs for the vintage color Tabouret chairs, and they look great with our light/medium color wood table. My kitchen looks more open with these chairs, as they are a bit lower than my other chairs, and more open on the seat back. I am hoping to buy additional chairs when the vintage color is back in stock. Very pleased with the Tabouret chairs. I am so pleased with my chairs! I only wish I had ordered 2 more sets before they sold out. Crossing my fingers that they will come back soon! They are small chairs, perfect for my space. And they are surprisingly comfortable. I love them. Please bring them back Overstock.com! Not much to say. 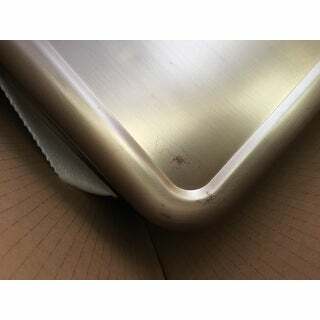 Product came within a week and was exactly what they advertised, packaged well and no issues wtih the product or delivery. I love these chairs around my farmhouse table. We are a pretty small family, so no issues with size. Easy to move around too if needed. Great price! I just adore these chairs. I just adore these chairs. They are bistro sized, So be aware of the dimensions. But I find them totally comfortable. We aren’t small and they are fine around a small round table. Very very durable and sturdy. Easy to wipe off and clean. Nice finish that doesn’t look cheapy. I’d buy these again and again. We’ve had them 3 years and they look as good as the day I got the,. Not a bit of squeak or wobble. I bought a set of these chairs and loved them! I decided to purchase the "matching" bench and it didn't "match". Chairs were more silver where as bench was more of a bronze. I decided I could live it. I then ordered 2 more sets of chairs so that would have 6 total for my table. 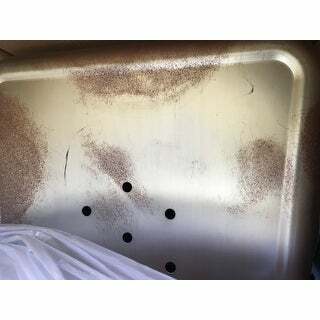 The first set arrived with strange rust looking paint splotches on them. I returned them as I know based on the 1st set I received they weren't supposed to look like this. My second set and the replacement set both had the same defects. I'm very disappointed as I'm not stuck with only 2 chairs and a mismatched bench. I normally always read reviews before purchasing items online and for some reason i didn't read the reviews on these until after I ordered them. I was very worried that they were going to be too small. I'm 5'8" and my husband is 6'0" and neither of us could be described as dainty, maybe just average. I'm happy to let you know, they are not too small and our bums fit in them just fine. They are smaller in general than an average chair but I certainly didn't feel like I was sitting in a small chair. They're fabulous for small spaces. We ordered them in white and they are so beautiful. I can’t say enough about these sturdy fining chairs. I make purchases for group homes and we go through a lot of chairs. These are the perfect combo of stylish and sturdy. Great chairs! Pretty light and stackable. Very sturdy and hold up well They are also a very pretty color. Not too industrial grey. It has a nice finish on them. These chairs are perfect!!! They arrived quick and where packed well! We ordered 5 sets for our back porch table! These will get a ton of use in the coming years and I can tell these will hold up well! I had to return these chairs because they sent the wrong color. I ordered white and received black. Decided not to exchange for the right color because the chairs were a little smaller than I anticipated. But definitely a cute bistro chair! I have now purchased 3 sets. Very happy with the color, weight and quality! Have had the chairs for several years. Great for posture and only thing my dogs won't chew. They are a great compliment to my kitchen and receive so many compliments on them. I have had these for over a year and still love them. Great quality and delivered quickly. "Does the foot glides adjust for leveling?" "Will the silver chairs match gunmetal bar stools?" "Has anyone found cushions that fit on these chairs?" "Are the white chairs a bright white or a creamy white?" 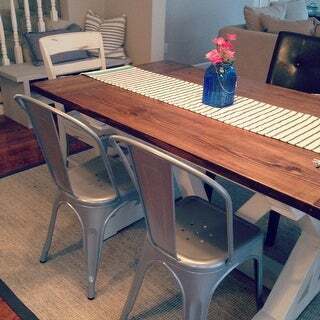 "Looking at this table & the vintage wood seat dining chair or the bistro steel dining chair in vintage. 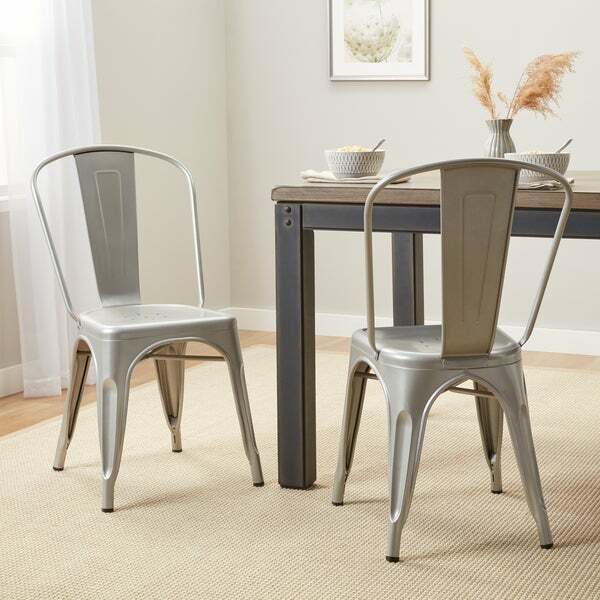 Would either of these chairs match the table"
ITEM# 16190403 might work for you. I only purchased chairs, but my professional opinion based on the chairs in person is that they would work! "Is there any lead in the "metal, steel" of these chairs?" "Description says seat width is 15" although some reviews state it is smaller, even down to 13". What is the ACTUAL width and depth of the seat?" I measured the chair: 17 W x 18 D x 34 H Seat: 14 W x 14 D x 17 H Back:17 H Dimensions are approximate and in inches.